Four Argonne research projects have earned R&D 100 Awards, long considered the ​“Oscars” of scientific innovation. Two of the winning technologies—Darshan and Swift/T—are advancing high-performance computing capabilities for science. The elite competition, sponsored by R&D Magazine, recognizes the 100 most innovative technologies of the previous year. Winning projects have included sophisticated testing equipment; innovative new materials; disruptive chemistry breakthroughs; new biomedical products; and breakthrough consumer products and new technologies spanning industry, academia, and government. A total of 134 R&D 100 Awards have gone to the U.S. Department of Energy’s Argonne National Laboratory scientists since the competition began in 1964. Darshan Software is a joint effort of four members of Argonne’s Mathematics and Computer Science (MCS) division—Philip Carns, Robert Latham, Robert Ross, and Shane Snyder—in partnership with Kevin Harms of the Argonne Leadership Computing Facility (ALCF), a U.S. Department of Energy (DOE) Office of Science User Facility. The Darshan software package enables researchers to investigate and tune the I/O behavior of complex high-performance computing (HPC) applications. A key feature of the package is its ability to run on some of the largest systems in the world, including Crays, IBM Blue Gene systems and Linux clusters. Tuning I/O workloads for such systems is nontrivial; and although I/O profiling tools do exist, they are generally ill-suited for increasingly complex HPC environments. In contrast, Darshan’s modular design allows it to be easily extended to include new components in the growing I/O stack. Moreover, instead of costly end-to-end tracing, Darshan captures statistics such as elapsed time and access patterns for each application, deferring communication and I/O operations until after the application terminates. Darshan then unifies, compresses and stores the information in a single shared record that can be analyzed, visualized and summarized by using Darshan utilities. “With this approach, we ensure that the overhead is minimal, making Darshan well suited for deployment on production HPC systems,” Carns said. One of the other winners, Swift/T: Dataflow Programming for Scientific Supercomputing Workflows, is a software system that scientists use to run calculations on very large supercomputers. It has been successfully used by cancer scientists and combustion engine designers, among others. The technology allows researchers to distribute the computational work of scientific studies and make good use of parallel computing systems. 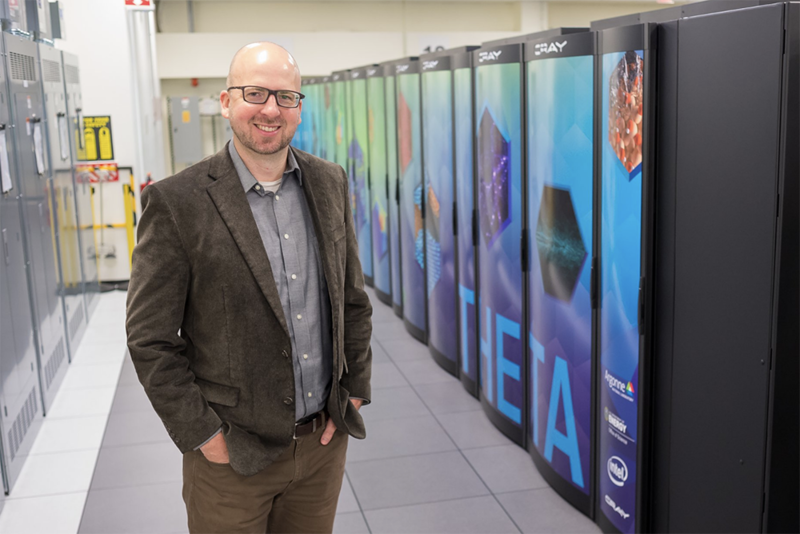 The system was created by Argonne’s Justin Wozniak, Jonathan Ozik, Nicholson Collier, Michael Wilde and Ian Foster, along with two outside collaborators, Tim Armstrong (Cloudera) and Dan Katz (National Center for Supercomputing Applications at the University of Illinois at Urbana-Champaign). Swift/T allows researchers to distribute the computational work of scientific studies and make effective use of the large scale computing systems available at Argonne, such as Mira and Theta at the ALCF. It has been successfully used by cancer scientists and combustion engine designers, among other application collaborations both at Argonne and elsewhere. The other Argonne projects to win 2018 R&D 100 Awards are HyMag Magnets and the Grassroots Infrastructure Dependency Model (GRID-M). HyMag, developed by Kaizhong Gao and Yuepeng Zhang from Argonne's Applied Materials division, is a technology that significantly increases the usable magnetic density of a permanent magnet by 10 to 30 percent, dramatically improving the energy efficiency of electric motors and wind turbine generators. GRID-M, created by Argonne's Kyle Pfeiffer, Tom Wall, Carmella Burdi and Scott Schlueter, provides public safety officials with the near-real-time status of critical supply chains following major disasters. 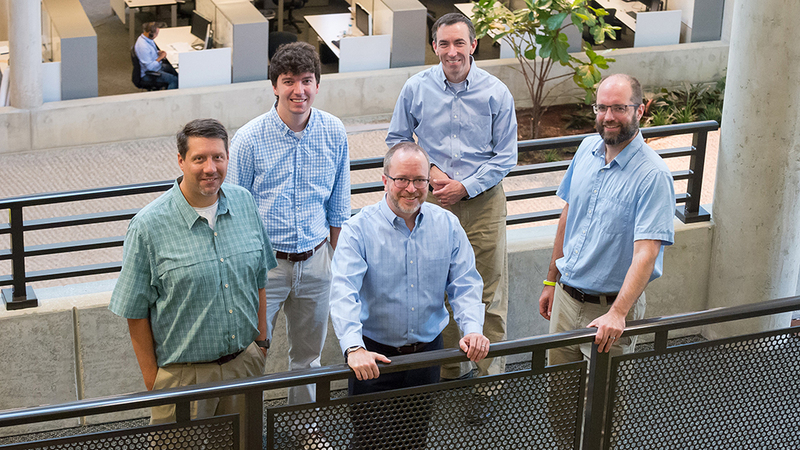 Top image: (From left) Kevin Harms, Shane Snyder, Philip Carns, Robert Ross and Robert Latham of the Darshan team. Bottom image: Justin Wozniak of the Swift/T team. Not pictured from the Swift/T team are Jonathan Ozik, Nicholson Collier, Ian Foster, Michael Wilde, Tim Armstrong and Dan Katz.